Those who protest that only regime change and full recognition of human rights in Cuba should precede any deal have surely had their arguments demolished. 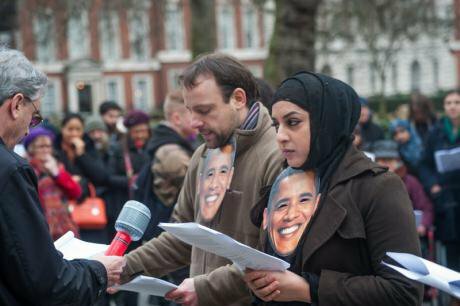 London protest tells Obama "Close it now', 2015.Demotix/ Peter Marshall. All rights reserved.This month marks the 112th anniversary of the signing of the lease for the Guantánamo base between the Cuban and US governments. For at least half this period the base hasn’t been welcome in Cuba, and it’s high time the US worked out a timetable to hand the land back to the Cubans. The current negotiations between the two governments provide an excellent chance not only to recognise the injustice of the lease but also for the US to pursue two of its own objectives about the base and about Cuba. So far, the issue isn’t even on the table, but it should be. At the very end of the nineteenth century, Cuba became a virtual colony of the United States as a result of the latter winning the so-called Spanish-American war. Initially the US gained Cuban support by promising (through the ‘Teller Amendment’) that its role was temporary and it would then ‘leave the government and control of the island to its people’. But what should have been the final stages in Cuba’s war of independence became instead (according to Richard Gott) a four-year US military dictatorship that lasted until 1902. When Cubans showed renewed signs of wanting the independence they thought they’d already won, it was permitted only after they were humiliated into accepting the ‘Platt Amendment’. This effectively reneged on the earlier promises, established a permanent right for the US to intervene whenever it felt the need, and specifically required Cuba to lease land for ‘coaling or naval stations’. On the face of it, Platt both legitimised a series of military interventions over the period until 1923 and paved the way for the Guantánamo lease. Although it was repealed in 1934, the amendment was replaced with a new treaty that allowed the naval base to be kept indefinitely. The US hold on Guantánamo was further tightened by the Helms-Burton Act in 1996: this effectively made the return of the base conditional on regime change in Cuba.